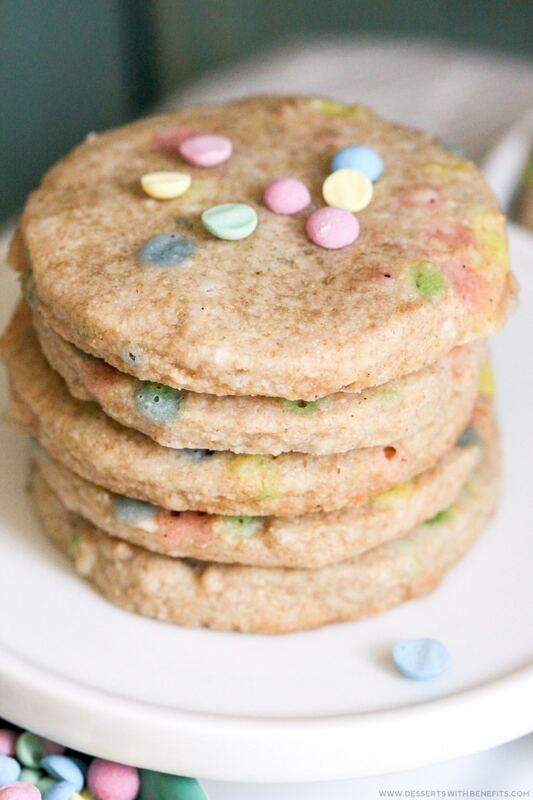 Healthy Funfetti Shortbread Cookies — simple, sweet, buttery, and delicious. You’d never know these are sugar free, gluten free, dairy free, and vegan! To me, Shortbread Cookies are served at classy affairs with tea, biscuits, and people who wear fancy clothes (a stark contrast to me, as I wear pajamas and/or yoga pants for about 99.9% of my life). I was craving my Healthy Shortbread Cookies for some reason (hmmm, I wonder why… BECAUSE THEY’RE SO DAMN GOOD, THAT’S WHY), but wanted to make a fun and exciting, not so “formal” new flavor. I opened my fridge and saw a little jar of Homemade Rainbow Confetti. FUNFETTI SHORTBREAD COOKIES IT IS! And boy, was that a good decision. These Healthy Funfetti Shortbread Cookies are buttery rich and satisfyingly sweet. I could eat these for breakfast, lunch, and dinner. Healthy Funfetti Shortbread Cookies -- simple, sweet, buttery, and delicious. You'd never know these are sugar free, gluten free, dairy free, and vegan! Roll ⅓ of the dough in between two silicone baking sheets until ~½" thick. Sprinkle ⅓ of the rainbow confetti onto the partially rolled out dough, then roll again in between two silicone baking sheets, this time until it's ~⅛" thick. Use a 2" circle cookie cutter to punch circles into the dough. Peel away the dough surrounding the circle shapes, putting the dough back into the stand mixer bowl, and transfer the silicone sheet with the circles onto a cookie tray. Bake for ~12 minutes, or until the cookies are golden brown around the edges. Carefully transfer the silicone sheet onto your counter or a wire cooling rack to cool completely. Keep re-rolling the dough and baking until all the dough is used up. 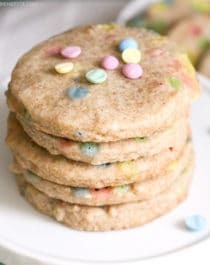 Even with the added Rainbow Confetti, these Healthy Funfetti Shortbread Cookies come in with less calories, less fat, and less sugar for the same serving size (3 cookies) than Keebler’s Sandies Classic Shortbread, which has 240 calories, 13.5g fat, and 10.5g sugar. That’s what I call a win-win-win. If you’ve made my Classic Shortbread Cookies, then you know full well how simple, yet addicting, they are. But these? Daaaaang, these are dangerously addicting. These look so fun and happy! perfect for spring!